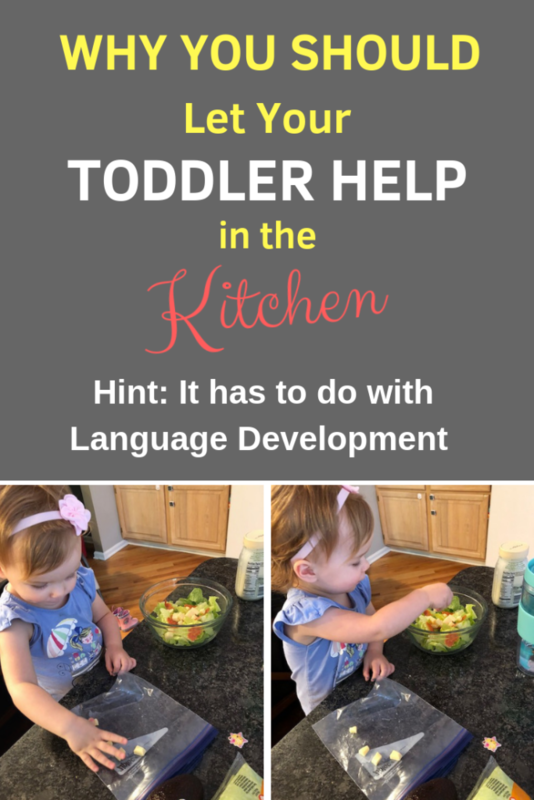 Get Your Toddler Talking: How to Let Your Toddler Help in the Kitchen | Speak. Play. Love. Full disclosure: This post contains affiliate links, which means we may receive a commission if you click a link and purchase something that we have recommended. While clicking these links won’t cost you any extra money, it will help us keep this site up and running! Thank you for your support! 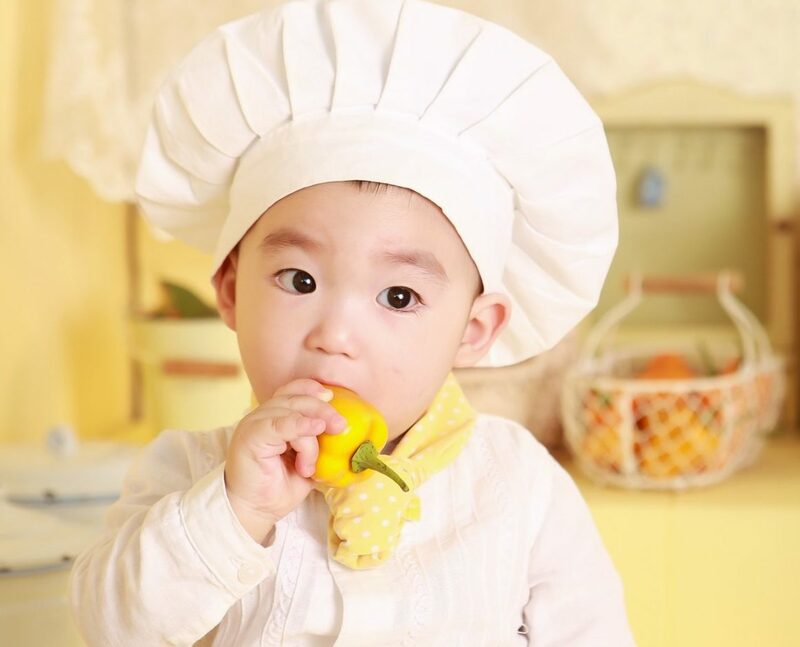 Cooking with your child is a great opportunity for all types of learning – especially language development. 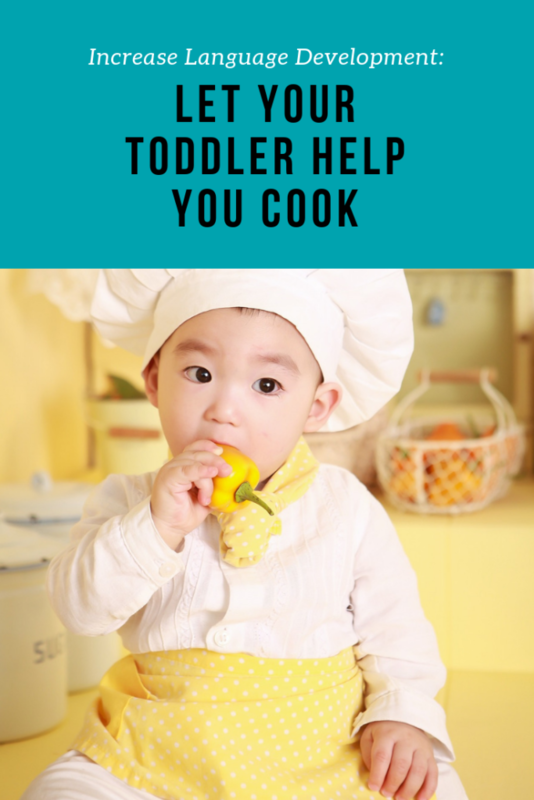 Plus, it is a great bonding experience that could lay the foundation for cooking together as your child grows! 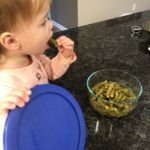 Since I usually do some sort of food prep every day, I’ve really been enjoying that Sylvie is old enough to start to “help” me in the kitchen on occasion (as long as it doesn’t involve the stove top). 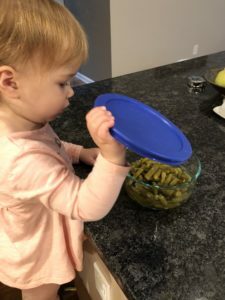 At 19 months I thought she might be too young to be interested, but she loves it! I always tell her that she is a big helper, which she loves. 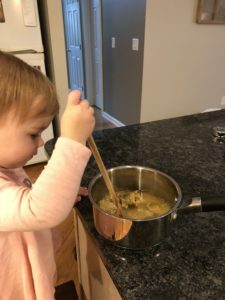 At this age, she wants to imitate everything I do anyway, so it seems like the perfect time to introduce cooking! During cooking, Sylvie usually stands on a chair right next to me. 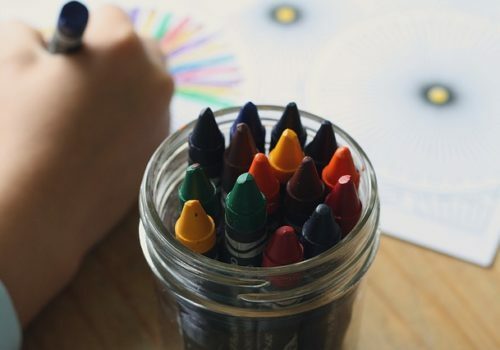 Lots of people use a Learning Tower – these are popular with the Montessori crowd because they foster independence – and are obviously safer than standing on a chair. I heard about Learning Towers from a friend of mine. Her husband actually made one! There are plenty of tutorials online if you search for “Ikea Hack Learning Tower” Click here for a link to a good tutorial. 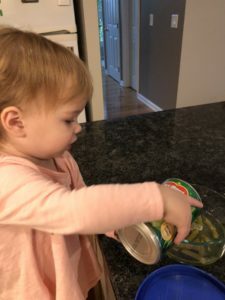 • Handing me items I need, especially when I’m rinsing a bunch of potatoes! 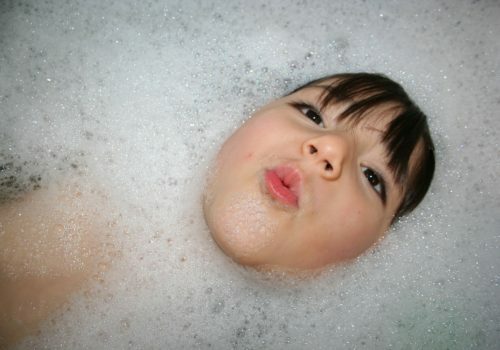 • Narrate what you are doing in short sentences and phrases like “Pour in,” “Cut banana,” or “Mommy is mixing.” This is called Self-Talk – click here to learn more about using self-talk. 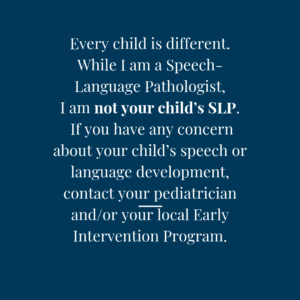 o You can also work on following directions and identifying items (in speech therapy we call this receptive language). 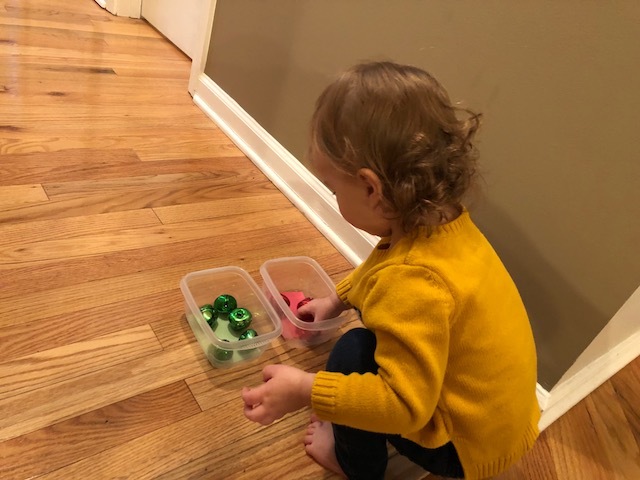 This can be simple directions for toddlers “Give me the apple” paired with a gesture or even physically helping them follow the direction the first few times. o For older kids, you can have them follow kid-friendly recipes with your help. 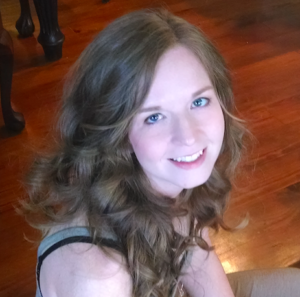 Please leave a comment below – I love to hear from readers! 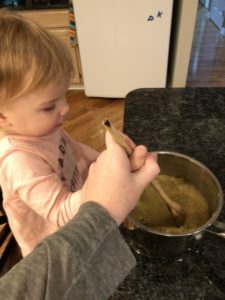 If you cook with your child, what simple recipes do you recommend? Does anyone out there use a Learning Tower? Do you think it worth the price? Any ideas for entertaining your toddler in the car?